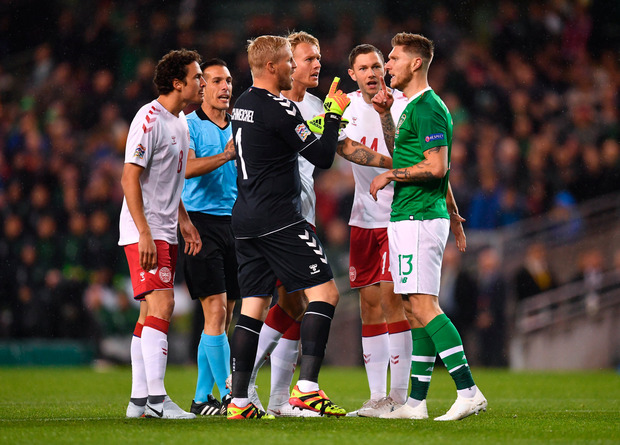 DANISH manager accused Ireland of transgressing the "rules of football" after the most controversial incident of an otherwise dull scoreless draw. Jeff Hendrick almost scored in the fifth minute when the Danes had presumed he was going to put the ball out of play once Harry Arter fell to the ground with an apparent injury. "I told the fourth official that the referee has to see that our players want to play fair play," said Age Hareide. "An Irish player goes down and they let the Irish player run. "The referee should whistle and then drop the ball after that incident. It's against the rules of football. "Any doubts about people being mis-led or trying to play fair play, the referee should be aware of that. The responsibility in this situation lies on the referee." Irish boss Martin O'Neill revealed that Hendrick had been unaware of the developing situation and hinted that it might have led to his side allowing the Danes an uncontested equaliser. In any event, Hendrick unwittingly spared any embarrassment by haplessly driving a shot wide of Kasper Schmeichel after finding himself clear on goal. "Jeff was totally unaware, I was talking to him there," said O'Neill. "He thought it was a sloppy pass from their player. "It would have been interesting if he had scored the goal. It might have been one of those incidents where we might have had to let them score at the other end." Ireland had a late penalty shout but Shane Duffy was booked for simulating a dive; O'Neill admitted that his side would not have deserved a dramatic denouement. "I've seen it back and it would have been harsh. If it had been given against me, I wouldn't have been too happy. He has touched him but I think it wasn't a penalty." O'Neill plugged the many defensive gaps revealed in two successive heavy defeats by over-loading his side with defensively-minded players but nonetheless claimed that his side could have won the game, as had been his aim. "I thought in periods of possession, we looked to do something with it. They made a sub at the end, a defender for a forward, which may have told you something. "Our intent was to create more than we did. We allowed them to dictate the game early on and we were chasing it although they didn't create too many chances. But then we kept the ball and started playing a bit. "We're re-building again after the defeat against Wales. We kept a clean sheet which is important. It's a re-building process." Cyrus Christie was one of a number of players selected in an unusual position, deployed in central midfield where he often looked cumbersome and ineffectual in possession, albeit he rallied to produce Ireland's only shot on target with a 71st minute rasper which rattled Schmeichel. "I thought Cyrus was terrific. That position is not a problem for him. He doesn't always play for is club but he's in good physical condition. "He's played full-back and right wing-back for me and I thought he did very well indeed and he helped young Matt Doherty as well. And he had a great effort on target as well. "We wanted Matt to play in his proper position and there was a lot of expectation on him after his start in the Premier League. He didn't do too badly at all with the help around him. "Callum Robinson came in and enlivened us, got the crowd going and it was brilliant for him to make that impact. "I think they're ready for Wales, we'll see how they come out of this game. A lot of them don't play for their clubs and we didn't think Shane Long lasted longer than we expected. "Callum O'Dowda went off after feeling dizzy from a first-half knock. I don't know if it was concussion. They are assessing him. He wanted to continue, he's a brave man but the medics decided otherwise. "We had one shot on target but we had a clean sheet, building blocks for us. Our attitude was to try and win the game and we nearly did that towards the end." Hareide refused to accept that the absence of Christian Eriksen diminished his side's chances of victory against a heavily fortified Irish defence. "It's not easy to say that because we don't know. Christian will strengthen our team but we have to manage without him. "This team needs to play matches without him, we can't rely on him all the time. He is a superb player and he of course sometimes makes the difference to us. "I am happy, we play away. Ireland were hard to break down. We were happy after the win at home to now see Wales and Ireland battle it out and see who's going to win the next one. "Normally, if you have the ball a lot of time, you have the chance to win the times. Not many teams win championships without the ball, some times many years ago it happened in England. "They played 3-5-2 or 4-4-1-1. In Poland, they played 3-5-2 and they were solid at the back and it is hard to break down. "They are strong in set-pieces. "When you get three teams in the group, it's like being in the final stages of the Euros or the World Cups. You have so few matches, you have to play tactically. After beating Wales, the way to win the group is not to lose to Ireland and let the other teams battle it out now. "We had a similar situation with England and Croatia in the other group. Teams are well-organised, there are few goals in international football these days, teams are hard to break down. There were a few chances today, it wasn't that bad. "It will be a tight game between Wales and Ireland. If I were a gambling man, I think it would be a draw."